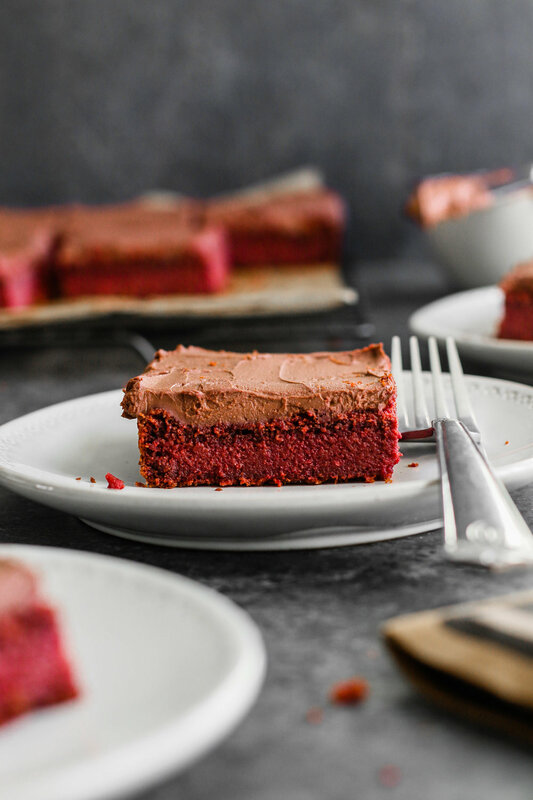 Vegan and gluten-free red velvet cake sweetened with unrefined coconut sugar and made red with raw beets. 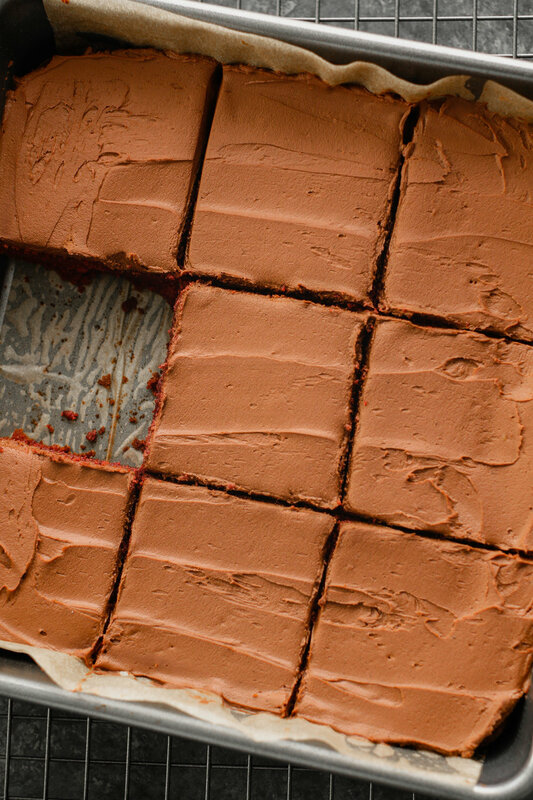 Finish it off with a decadent 2-ingredient chocolate frosting. A blend of oat and almond flour create a fluffy gluten-free flour batter that’s sweetened with unrefined coconut sugar. Preheat oven to 350 degrees and line 1 large rectangular pan with nonstick spray or parchment paper. To a blender, add the beet purée, almond milk, lemon juice, applesauce, and flax eggs. Pulse until well combined and vibrant red. Pour into a large mixing bowl and set aside. Heat the coconut oil in a small saucepan over medium heat. Once melted, add to the mixing bowl with the cacao powder and coconut sugar. Mix. Next, sift in the oat flour, almond flour, and baking powder and stir well until there are no flour clumps. If you don’t have a sifter, simply mix dry ingredients in another bowl and add to the wet mixture while beating. The batter should be thick but pourable. Add batter to your cake pans and spread into an even layer. Bake 40-45 minutes, or until a toothpick inserted into the center comes out clean. Let cool completely before frosting. While the cake is cooling, prepare your chocolate frosting. Add the the coconut milk can to a small saucepan and bring to a simmer over medium heat. Add the chopped chocolate to a large heat-safe bowl. Once the coconut milk is warm, pour over the chopped chocolate. Cover with a sheet of parchment paper or towel to trap in the heat. Allow to sit for 5 min. Once melted, put into fridge for 1-2 hours to thicken. Frost your Cake and enjoy! Serve immediately or store leftovers in the fridge for 3-4 days.